I've been getting a couple of requests for my thoughts on The Dark Knight Rises prologue, some, from guys nowhere near an IMAX so below I’ve tried to give as much detail as I can. My post is split into 3 segments; the first outlining why The Dark Knight Rises could be good, the second running through the footage of the prologue and 1 minute montage from The Dark Knight Rises with commentary and the third some thoughts. So you can skip to the bits that interest you. OK! 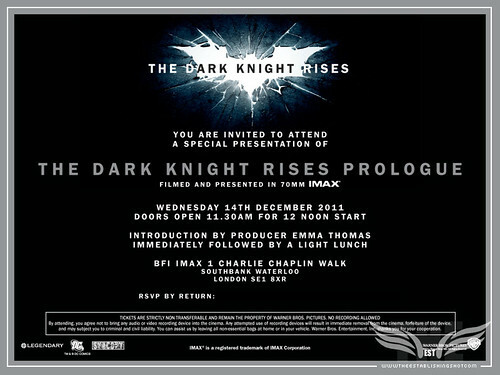 So early today I was one of the lucky few invited along to see the much buzzed about 6 minute 15 seconds prologue to Christopher Nolan’s The Dark Knight Rises at the IMAX Waterloo. First off in case it is unclear I have been a huge Batman fan from the time I was a kid. I have read almost every Batman comic up until about 1995. Yes! The year Joel Schumacher’s Batman Forever was released. Since then I have dipped back into comics usually to purchase rare or hard to find items. My relationship with Batman on screen has also changed - having enjoyed Tim Burton’s 1988 Batman as the best representation of Batman on screen till that point. Then suffering the series’ increasingly bizarre slide into a shambolic parody. However in 2005 things seem to be back on track and I was blown away with surprise at Christopher Nolan’s Batman Begins. As he made an intelligent Super Hero film that included many iconic elements from the adult Batman mythos grounded in reality as well as exploring the psyche of a vigilante that dressed up as a bat. I was then disappointed by the mess that was The Dark Knight that seem to rely too heavily on the rule of Super hero sequels double the threat, double the villains and not enough on solid story. Even more bitter was my disappointment as I made a great effort to avoid anything Batman related leading up to The Dark Knight so I could enjoy the story spoiler free. Including what is considered to be the best ARG viral campaign for a film yet. But I was hopeful as later Christopher Nolan’s masterful Inception showed us that he could make an intelligent film that did not pander to the Studio system that could be a blockbuster. In fact it was the watershed moment for me as I moved away from just appreciating Nolan’s technical filmmaking abilities to having faith that he may become one of our time’s greatest directors. That combined with Bane being one of the best villains within the Batman Universe. I purchased his one off introduction comic Batman: Vengeance of Bane, back in 1993 on its release and whole heartedly bought into his introduction into the fairly staid and circular Batman world of the time. The effects of Bane's introduction were repeated with other heroes in the DC stable. In the bigger scheme of things Bane was a character from my time. Not an existing character whose quirks and traits I had to adapt to, to understand. He was created of my world making him so much more relevant. I was there at the beginning and felt he was a character more in tune with my post – A Death in the Family, Arkham Asylum, The Killing Joke, The Dark Knight Returns, Year One - Batman world. All fine comics if you are considering an introduction to comics. Also his introduction into Batman’s universe was actually very clever and well thought out. I highly recommend the earlier Bane comics. I wasn’t wild about the later story arcs Knightquest and KnightsEnd of the KnightSaga or No Man's Land which seems to be an influence on Nolan’s The Dark Knight Rises. So you can imagine my outright glee when I received this invite in the mail. 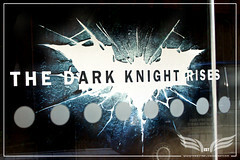 The Establishing Shot: Batman The Dark Knight Rises Prologue IMAX London screening invite, a photo by Craig Grobler on Flickr. I made my way to the IMAX in the chilly London air. I was surprised at how packed the IMAX foyer was. It seems everyone wanted a piece of The Dark Knight Rises. While waiting not a minute went by that I wasn’t offered a refreshment. The doors open and I made my way directly to the centre of row M, the best seats of the London IMAX. Josh Berger MD of Warner Brothers UK came out to introduce and thank Producer Emma Thomas for taking time out to come along and introduce the footage to us today. Next up Emma Thomas Producer and Chris Nolan’s wife thanked us for coming along to the IMAX to see just 6 minutes of Christopher Nolan’s The Dark Knight Rises. Thomas teed the clip up by saying that – showing what they called the Prologue footage was something that they had first done with The Dark Knight. The prologue of which was screened before I Legend and they were happy to the same again for The Dark Knight Rises – the prologue of which will be screened in IMAX cinemas before Mission: Impossible - Ghost Protocol. Christopher loves the IMAX format And The Dark Knight Rises experience will be as big and immersive as possible. As he makes films trying to re-create that wonder that he felt when he was young watching big, exciting, action films. And that this is ideally how he would like the film to be seen (IMAX). She hoped that The Dark Knight Rises will be released onto as many IMAX screens as possible. And ended with the clip we are about to see will introduce ONE of the main villains and we hope you enjoy it. We open up on a Warner logo and background running horizontally across the entire screen, revealing ice with cracks running through it behind the logo. Then we see the batman logo but a cracked and shattered version of the batman logo. 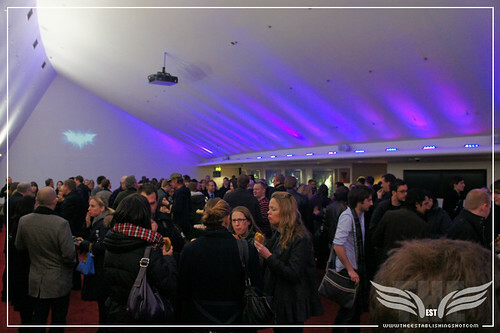 The Establishing Shot: Batman The Dark Knight Rises Prologue IMAX London screening, a photo by Craig Grobler on Flickr. This is in line with the earlier teaser trailer and continues the theme of a cold winter coming Gotham. This could also tie into DC Comic’s No Man’s Land story arc set in a time after Bane has broken the Batman and there is a territory struggle by various gangs and crime syndicates as the Gotham underworld fights amongst itself to rule Gotham. We open up on a medium close up of Commissioner Gordon (Gary Oldman) giving tribute to the deceased District Attorney Harvey Dent (Aron Eckhart). Jim Gordon: I knew Harvey Dent. I was his friend and it will be a very long time before someone inspires us like he did. I believed in Harvey Dent. Jim Gordon walks away from the pulpit. The assumption is that this is Dent’s funeral and Gordon is giving a eulogy. This also seems to be the continuation link between The Dark Knight and The Dark Knight Rises. We now are now moving shoulder high through a wheat field, a beige four wheel drive pulling ahead of us. Inside Doctor Leonid Pavel (Alon Aboutboul), a number of security men and in the back 3, black hooded prisoners. They are driving towards what looks like a DC 3 or 10. Aidan Gillen, hands on belt is waiting in front of the plane and seems to be the team leader. Back to the prisoners. OK! So this could be Operation 98H1, codenamed Operation Early Bird teased at, with The Dark Knight Rises viral game. The 3 leaked CIA documents outlining the disappearance and possible exchange of Doctor Pavel between in-country militia (I assume Georgian) and the C.I.A for 3 Million Dollars. Now everyone is out the four wheel drive, in front of the plane. Aidan Gillen introduces himself to Doctor Pavel as CIA. Ok it is confirmed that this is Operation Early Bird and that must make Aidan Gillen - Operative FO439. The Security man/Georgian Militia (Josh Stewart) curtly explaining that Pavel was not alone. CIA Operative FO439 (Aidan Gillen): You don’t get to bring friends. Georgian Militia: Don’t worry! No charge for these. CIA Operative FO439: And why would I want them? Georgian Militia: They were trying to grab your prize; they work for the masked man. CIA Operative FO439: Get them on board I’ll call base. I’m not a trained CIA officer but alarm bells are ringing. Seriously? The 11th rule of security work is you do not let anyone in your vehicle without checking them out first, especially if you are conducting security sensitive, cross border, high value target extraction involving air flight. Sloppy. The full IMAX screen being used to great effect as we see something other than close up or people. The CIA plane is now in the air flying over a mountainous terrain. Inside the plane CIA Operative FO439 explains the flight plan he filed includes the transport of; himself, his men, Doctor Pavel and only one of the prisoners. Emphasising this with his gun. It is now clear that these aerial scenes were filmed in Scotland. He signals his men. They grab one of the prisoners, open the plane door and dangle him precariously at the door. CIA Operative FO439: The first one that talks gets to stay on my aircraft. Now with his gun at the prisoners head he demands to know who sent them to get Pavel. No response. Wow! We are really straight into it. The CIA are coming out fighting. CIA Operative FO439 fires a shot past the prisoners head saying “he didn’t fly so good”. A bluff this CIA Operative FO439 is still in the game, which makes the whole not checking the prisoners out before letting them on your plane even more baffling? And must be an indication of what must surely happen next. CIA Operative FO439: Who wants to try next? Signaling his men. The next prisoner is taken to the door. CIA Operative FO439: Tell me about Bane. Why does he wear the mask? Again nothing. A lot of loyalty for a hired gun! Third Prisoner: Perhaps by now he is wondering why someone would shoot a man before throwing him out of a plane. He sounds mature, cultured, measured and possible German/Eastern European, a lot like Jeremy Irons in Die Hard: With a Vengeance. CIA Operative FO439: At least you can talk. Who are you? Slowly the drums of Hans Zimmer’s chant fade in and get louder and louder. CIA Operative FO439 is facing the kneeling Third Prisoner (Jeremy Irons) now. Third Prisoner (Jeremy Irons): It doesn’t matter who we are. What matters is our plan… No one cared about me till I put on the mask. CIA Operative FO439 removes the Third Prisoner (Jeremy Irons)’s hood to reveal BANE! In all his ventilated nefariousness. Nolan does not let the camera linger and we cannot take the full spectacle of Bane in. They are now facing each other eye to eye. Hans Zimmer chant getting louder. CIA Operative FO439: If I pull that off will you die? CIA Operative FO439: You’re a big guy. Hardy’s delivery is matter of fact with no sign of malice he is threatening the CIA Operative FO439 but there is no emotion what so ever. We can hear the verbal bits of Hans Zimmer chant now. Deh Shay! Bah-Sah-Ra! CIA Operative FO439: Was getting caught part of your plan? Cut to a shot of the CIA plane flying over the mountainous terrain, quickly a larger beige Hercules flies into view above the CIA plane. Bane: Doctor Pavel refused our offer in favour of yours; we had to find out what he told you about us. Bane slowly turns his head towards Pavel. The Hercules’ rear cargo door lowers. Turbulence from the second larger plane rocks the CIA plane. CIA Operative FO439: Well Congratulations! You got yourself caught. Other CIA Operative: Trying to draw CIA Operative FO439’s attention "Sir!" CIA Operative FO439: Now, what is the next step in your master plan? Black garbed para troopers jump out the Hercules attached to cables. Zimmer’s chant is overpoweringly loud. The para troopers smash into the sides of the CIA plane firing through the windows at the CIA operatives. Bane springs into action striking CIA Operative FO439 in the throat. The Para troopers attach cables to the CIA plane and the Hercules pulls the CIA plane vertically under it. Throwing the plane into confusion and everyone towards the bottom of the plane/cockpit door. Bane is still hanging on near the top of the plane. The paratroopers blow the tail of the plane off. Enter the plane killing the final resistant CIA operative. They have a black bag with them revealing it to be a body bag. The para troopers and Bane attach what I assume is some sort of blood transfusion kit to Pavel and the dead body in the bag. I assume that they are either filling the body with Pavel’s blood to fool investigators in to thinking that Pavel has died in the crash. One of prisoners appears to be readying up and attaching himself to a cable. Bane places his hand on his arm. Bane: No, they expect one of us in the wreckage brother. Cultist: So we started a fire? Leonid Pavel is in pain, thrashing and screaming. Bane: Calm down Doctor. Now is not the time for fear. That comes later! Bane flicks a switch and the remainder of the CIA plane falls while Bane and Pavel attached in tandem to him are left hanging by cables as the plane falls below them to the ground. The Hercules flies off with Bane & Pavel in tow getting lost in the sheer scale of the IMAX screen. Fade to black and we are then treated to a short montage flashing imagery from The Dark Knight Rises set to loud drum beats. This could conceivably be spoilerish but I assume will be in the forthcoming trailer anyway. Batman drawing up the strange light gadget/weapon as seen on the cover of Empire Magazine. Bane with his fur coat on the steps of a stately Gotham building - Gotham Courts? City Hall? Gotham Jail? The Bat jet/copter flying down a street either with or chasing two beige tumblers. A number of men climbing into the same well as seen in the Dark Knight Rises teaser trailer. A huge street fight between what I think are the police and Bane’s cult on a tear gassed street blocked at one end by two beige Tumblers. Bane in gear flicking a switch and setting of some sort of bombs /rockets/missiles from behind him. Cheers ensue. Followed by a well catered lunch and refreshments in the foyer to discuss what we had just seen; Wow, Incredible, couldn’t hear what Bane was saying, was that Aidan Gillen? Was that Josh Stewart? Yea it was good but not amazing, what was happening with the blood thing? Nolan can’t really draw parallels between that terrorist and Bane can he? Did you get a Bane or Batman T-Shirt? 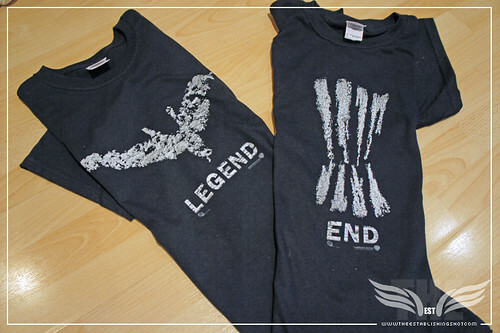 The Establishing Shot: Batman The Dark Knight Rises Batman & Bane T-shirt Legend End, a photo by Craig Grobler on Flickr. Too be honest my inline commentary is sparse because a lot was happening at a break neck speed. First off - what is interesting is that Christopher Nolan has said that The Dark Knight Rises is set 8 years after The Dark Knight. So either Jim Gordon’s speech at the beginning is not Harvey Dent’s funeral eulogy or the prologue and Pavel’s handover takes place before the bulk of the story and is laying the ground work for something ominous that takes 8 years to come to fruition. Like say a Gotham without Batman (who has gone into hiding after the climax of The Dark Knight) falling into disrepair and been fought over by the underworld. Further affirmed by Bane response to “So we started a fire?” – “The Fire Rises”. Where it will end will no doubt be Gotham on its knees and The Dark Knight Rises. This heightens my assumption that Christopher Nolan could be drawing on themes from Frank Miller’s The Dark Knight Returns for The Dark Knight Rises in question. The Dark Knight Returns takes place 10 years in the future outside the Batman timeline. And an ageing Batman comes out of hiding to take on a futuristic gang that have taken over a crumbling Gotham, the returned Joker, the media as well as the Gotham city police. In the end Batman dies. But Superman detects a faint heart beat while the Batman lies in his coffin. A lot of which has been hinted at. Hey, isn’t Nolan producing the Man of Steel? I’m just saying. Wouldn’t that be great? There are also similarities between what we have seen of The Dark Knight Rises and the No Man's Land story arc which Bane features; No Man's Land also drew on The Dark Knight Returns for inspiration when an earthquake hits Gotham leaving the city in disrepair, the Government is forced to seal Gotham and those who want to remain inside to fend for themselves against the underworld trying to take over Gotham. A minor one, but Bane does not disclose whether removing his mask cause Bane pain. Very clearly he tells Operative FO439 (Aidan Gillen) that removal of Bane’s mask would be painful for CIA Operative FO439 (Aidan Gillen). Not a misconception but there has been a fair amount of criticism regarding the intelligibility of Bane’s vocals. Sadly although I could make for the most part what was going on. It was a struggle. This could be a device to foil potential bootleg copies floating around but is more than likely part of an effort to add some realism to the effect that wearing a mask would have on Bane’s speech as well as I’m guessing that Banes vocal chords have been severely damaged by constantly having to breathe in a potent gas.How will this play out in The Dark Knight Rises? I’m guessing that Bane will probably not be very vocal throughout the film more the strong, clever, psychotic type. Similar to The Humungus in Mad Max 2: The Road Warrior – deal with it. Well, as Ms Thomas promised The Dark Knight definitely seems to be BIG if the prologue is anything to go by. Batman Begins started at the beginning with a young Bruce Wayne and Rachel Dawes playing in the garden when Bruce falls down a well. Before cutting to Wayne’s incarceration in a Bhutan prison and a jail yard brawl. The Dark Knight starts with a grand bank heist perpetrated by The Joker’s gang. Filmed in 4K IMAX format. The Dark Knight Rises starts with Gary Oldman delivering a speech before a scene a few 1000 feet above the ground with three large aeroplanes involved to film a scene that ends with the destruction of an aeroplane filmed in 4K IMAX format. The prologue from Batman Begins introduces us the young Bruce Wayne then shifts forward to a mature Bruce Wayne in the prison as he is faces a ruthless prison gang. This scene is fraught with tension and danger. I was giddy with excitement as he flies headlong into surely insurmountable odds? No! Wayne turns the tables and we get a real measure for who Christian Bale’s Bruce Wayne is and the measure of the man. For me the story roll out was one of the highlights of the Batman Begins as Nolan tells us who Bruce Wayne is and how he becomes the Batman. In direct contrast The Dark Knight introduces us to the lunacy of the Joker as we see a gang conduct a city bank heist. One by one and cold bloodedly the gang are disposed of to reveal the lone survivor as The Joker and his seemingly insane and completely ruthless plan, which is an indication of his larger anarchic approach and plan. Setting the tone of his particular brand of indescribable madness. As a side - we never find out with certainty of The Joker’s origin. Again in sharp contrast to the rich origin we are given in Batman Begins adding to the Joker's mystique. The Dark Knight Rises begins by using the law of sequels as Christopher Nolan introduces us to Bane. To make a difference his entrance has to be bigger, bolder, more ruthless and memorable than The Jokers. And this is achieved by raising the playing stakes – the target, Doctor Leonis Pavel is a nuclear Physcist, the sheer scale of the set up and involvement of international level trained para - military and CIA involved in audacious mid air hijack (with at least 3 planes involved in creating this stunt and knowing Nolan a lot of the stunt work actually happened took place a couple thousand feet above the Scottish Highlands). But what is actually happening in the scene? Well as I mentioned in my post over here! Bane is for all purposes the flipside of the coin to Batman, he is just as intelligent and physically capable - he just broke out of his handcuffs I've tried it's really difficult. - We are led to believe that they are facing a no-win situation Wayne against the ruthless prison gang, Bane held prisoner by the CIA team high above the ground. There is the added complexity of his introduction being obscured by the hood etc. but I don’t there was an audience member in the cinema who did not see through this and believe that Bane was one of the hooded prisoners; such is the hype and ubiquity of Nolan’s films. - In Bruce Wayne’s prison brawl the tension is heightened by Bale gaining sympathy from the audience - he has just woken from a nightmare and clearly has an ongoing struggle with the large gang and the muddy prison grittiness creates a fear that Wayne is out of his depth and may have bitten off more than he can chew, and is about to be taught a lesson. In direct contrast – even though their situations may be similar - Bane maintains a cold, methodical and uber confident façade throughout. - Both introductions are punctuated by humorous dialogue to reinforce their character. In The Dark Knight Rises Operative FO439 asks if he removes Bane’s mask will Bane die? Bane replies that it would be very painful… for Operative FO439! A couple of lines of dialogue but again highlighting the similarities in Bruce Wayne/Batman and Bane. - Bruce Wayne is revealed to be in training for something bigger (his eventual ascension to guardian of Gotham) Bane alludes to this all being part of a plan. So in essence Bane’s introduction is the dark mirror of Bruce Wayne’s introduction highlighting the counter balance between the two characters as well as bringing the trilogy full circle. Clearly the intention was to shock and awe using the rule of sequels. Bane’s introduction has been the biggest so far. Yet we no less about him. We do know is that he is very dangerous and not afraid of getting in the thick of it. We aren’t shown any Bane in his Venom/gas induced form. This is very noticeably missing from what we have seen so far. So either Nolan is busy with uncharacteristically creating this digitally or Bane will not change shape. Which to be honest would not be a disappointment for me. He seems fairly formidable as he is. Besides in the comics Bane never had the proportions of Hulk as was portrayed in the travesty of Batman Forever or the animated Batman adventures. Bane delivers his lines without pathos or emotion. He is very matter of fact about what is about to follow. There is no emotion when he threatens Operative FO439 and very little change we he declares that the plane is going to crash without survivors. This was a little chilling and I got a sense that Bane is cold blooded mother. Could Bane be saying that before the mask he was of no consequence or threat? A nothing and only when he put the mask on did he gain the strength/intelligence to become someone. Also this does allude to having no one care about him until the mask. Could a father like figure have helped him to gain/construct the mask? During the montage scene some figures are seeing descending the same well that a single broken figure that I believed was Bane as a child climbing out of. This well could play a large part in Bane’s origin. Again emphasising the similarities between the creation of Bane and the Batman. What would merit a team to descend well? Are they a League of Assassins Clan heading towards one of Ra’s Al Ghul’s regenerative Lazarus Pits? Is Bane’s origin related to the Lazarus Pit? When Emma Thomas introduced the footage she said “the clip we are about to see will introduce ONE of the main villains” This is reinforced on the plane when Bane says “It doesn’t matter who we are. What matters is OUR plan”. The hint is that Bane is not a lone operator and is in collusion or working for someone else. Following the rule of Super hero sequels. The question is who? Whether this be Ra’s Al Ghul, his daughter Talia and their League of shadows or someone else is not known. What we do know is that Bane has a Nuclear Physicist, a plan and Gotham will be thrown into chaos. Follow me over here Twitter @TheEstShot or Facebook > and please interact. Comments and thoughts always welcome below. The terrorist leader Bane arrives in Gotham City, and pushes its hero Batman to breaking point and beyond.